Although the importance of food tourism is growing, few studies have examined food tourists behavior in depth. This study opens up a new direction for the topic by linking tourists` behavior in searching for information on food tourism. The objectives of this study are: 1) to classify food tourists by food preference and food neophobia: 2) to examine whether there are differences in their behavior in searching for information among the different types of food tourists: 3) to examine if the presence of their previous experience influences their informational search behavior. For this study, information search behavior has been categorized into three factors: the types of food tourism resources, the types of informational sources, and the extent of efforts required to carry outthe search. Survey participants have provided their previous travel experiences with their informational search behavior. The findings show that tourists have different informational search behavior depending on the level of their food involvement and food neophobia, and based on their previous experience. This study provides practical implications on the development of food tourism management strategies. This study indentifies the consumption values of domestic tourists who used ‘Rail-ro’ free rail pass. This study analyzes the difference of preference tour activities among the classified group. For this empirical survey, 213 tourists who used the ‘Rail-ro’ free rail pass from January 21st to 25th, and February 26 to 28, visiting five selected cities, were selected as the sample group through face-to-face surveys. The results can be summarized as follows: Firstly, five factors for the consumption values were extracted such as “functional value”, “emotional value”, “epistemic value” and “conditional value”, Secondly, four cluster groups were segmented based on five factors by cluster analysis: “multi-purpose type”, “simple type”, “substantial type”, and “deviational type”. Thirdly, there was a difference among the four groups in preference for their tour activities. Such findings can be helpful to promote domestic tourism in young people who are relatively inexperienced domestic tourists, as well as enhance the marketing strategy for the Rail-ro free rail pass. The aim of this current study was to investigate the different benefits sought by single Korean womean and their outbound tour behavior. For this study, a survey was conducted with single women (aged 25-34, living alone). Out of 475 distributed questionnaires, 264 were analyzed (55.58% response rate). The data was analyzed as follows: factor analysis, reliability, cluster analysis, discriminant variable, one-way ANOVA analysis using SPSS. the resuls of the study are as follows: First through factor analysis. Korean single women lifestyles were categorized into five factors, and the benefits sought were divided into four factors. Second, the respondents were classified into three groups by cluster analysis: Low Energy group, Moderate Energy group, and High Energy group. Third, according to the results in conducting the one-way ANOVA test, the Low Energy group. Moderate Energy group and High Energy group were significantly different in terms of benefits sought in their outbound tour behavior. By understanding the results from this study, tourism industry practitioners can be aided in developing tourist products. The purpose of this study is to forecast a behavior model of Jeju convention participant as verifying whether the facts, suggested in the Theory of Planned Behavior by Ajzen, such as attitude toward the behavior, subjective norm, and perceived control, affect singnificantly the intentional behavior of Jeju Island convention participants. The difference between a first visitor and a return visitor to Jeju island are examined. Research indicates that the subject`s behavioral intention is affected by attitude toward the behavior and perceived behavioral control. The subjective norm doesn`t affect significantly the behavioral intention. There was no apparent significant difference between a first visitor and return visitor to Jeju island in terms of the three factors and relation with behavioral intention. Through this research, it is shown that the Theory of Planned Behavior is a very useful model to forecast the participation behavior of convention participants and surrounding pressure or opinion, visit experience are not the main fact for the participation behavior. Base on this study, further investigation is required. The purpose of this study was to verify the effects of psychological well-being through the yachting experience. For this study, a survey was conducted with participants in a yacht show and a yacht race by convenience sampling. 240 survey sheets were gathered in total, but only 192 were used in analysis. To analyse the data, frequency analysis, factor analysis, confirmatory factor analysis, correlation, and multiple regression with SPSS 18.0 and AMOS 8.0 programs were used. The result of this study indicates that the yacht experience affects the psychological well-being of participants. The experienced effect of yacht participants consists of 4 factors: education experience, escapist experience, esthetic experience, and entertainment experience. Education experience and escapist experience had the greatest influence on psychological well-being. The purpose of this study was to investigate leisure mobility patterns across social classes within a city. Transportation O-D data sets within Seoul for the years of 1996, 2002 and 2006 were utilized to analyze the patterns of leisure purpose mobility for each of three social classes. As the results of Social Network Analysis, there were significantly different in leisure mobility patterns across social classes and the different patterns affected the structures of leisure destinations within a city. For upper class destinations, club effects were found. For five destinations in Gangnam of Seoul, the ratios of people from upper class were much higher than that of other social classes for three analyzed years. On the other hand, ghetto effect was found where the ratio of lower class people was higher than that of other classes continuously. As the results of Mobility Analysis employed for all social strata, popularization effect, the imitation mentality toward the consumers` behavior of certain social class, was also identified in eight destinations. Being an initial attempt to understand different patterns in leisure mobility across social classes, this study generally supported Social Network Theory and provided basic information which was useful to establish systematic leisure policies. The limitation of this study and future research were discussed. The purpose of this study was to estimate the marginal willingness to pay (MWTP) for attributes of ecotourism in Dokdo using a choice experiment. Attributes include ecotourism courses, interpretive service by professional guide, transportation, and prices. Their levels include course A. B or C for ecotourism. Yes or no for interpretive service, ferryboat or helicopter for transportation, and six levels of prices from KRW 50.000 to 300.000. To this end both onsite and Internet surveys were conducted for residents in 16 metropolitan cities and provinces. The results of multinominal logit model show that course B and C, interpretive service, transportation, price, age, and income were statistically significant in explaining the probability of participation in Dokdo ecotourism. The results also indicate that MWTPs of changing course A to B and C were increased as KRW 78.823 and 110.62, respectively. MWTP of changing from no interpretation to interpretation was increased as KRW 60.517. MWTP of changing from ferryboat to helicopter was increased as KRW 10.667. but the former seems to be practically economical. American Airlines launched a loyalty program in 1981 and this program has significantly effected airline competitiveness. Although many airlines have operated this kind of program, the related effects vary. This study examines the relationships between perceived benefits, satisfaction, and loyalty of these loyalty programs using Structural Equation Models (SEM). A total of 340 respondents were randomly chosen in the summer of 2013. The results of the study reveal that perceived benefits of monetary savings, exploration. entertainment, and recognition related to loyalty programs of airline have a significant effect on satisfaction, and satisfaction is a significant antecedent factor of loyalty. Moreover, perceived effects (monetary savings, entertainment, and social) have an effect on loyalty of airline loyalty programs. These results suggest that the loyalty program of an airline may be a critical factor for competitiveness in the airline industry. The purpose of this study was to explore newspaper editorials` viewpoints on a mega-event by using semantic network analysis. 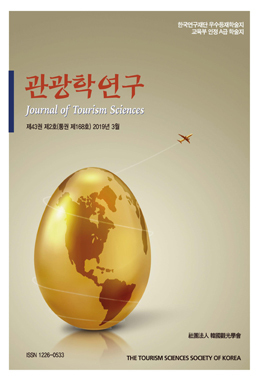 Fourteen editorial columns of three presses relating to the EXPO 2012 Yeosu Korea, one of the recent mega-events, were selected and analyzed. The selected media are the representative conservative, progressive and economic newspapers in Korean Journalism. In the Chosunilbo. ‘Yeosu’ and ‘Expo’ were strongly networked with ‘host’ and ‘ocean,’ which means that it emphasized on operation and the direct/in-direct effects of the Expo. In the Hankyoreh, ‘Ocean’ and ‘Sea’ were most frequently appeared. It means that it focused on the theme and contents of the Expo. In The Korea Economic Daily, ‘Invitation’ was most frequently stated and was strongly networked with ‘corporate,’ ‘success,’ ‘employment,’ ‘development,’ and so on. It can be said that it stressed economic phenomena. The results of this paper can help to better understand various newspapers’ viewpoints in respect to future mega-events.